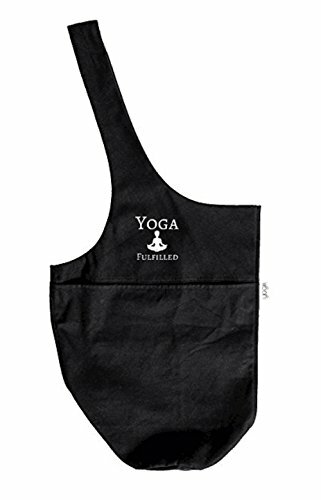 This Beautiful Yoga Mat Tote Bag has the Perfect Design to efficiently give your yoga mat bag a Secure Fit while still having Two Additional Pockets to carry your belongings! A Large Side Pocket to secure your water bottle, towel, and sandals, and a Smaller Interior Zipper Pocket to secure your key, wallet, and phone. The simplicity of the Strong and Durable Canvas Material, and no buckles or fasteners allows you to wear it Comfortably on your Shoulder while having it still look Nice and Fashionable. Original value is $39.99, so Grab it now for $21.99 before the Sale ends! Buy one for You and Your Yoga Buddy! Each purchase includes 1x Yoga Mat Bag. MULTI-PURPOSE USE - Can be used for many other Everyday Life Activities such as a Reusable Grocery Bag, a Shopping Bag, or even for Trips to the Beach! TWO ADDITIONAL POCKETS - Contains one Large Side Pocket with enough space to carry a Water Bottle, a Towel, Sandals. Also contains a Smaller Interior Zipper Pocket for your phone, keys, or wallet! If you have any questions about this product by Yoga Fulfilled, contact us by completing and submitting the form below. If you are looking for a specif part number, please include it with your message.